This is my first post about snakes, so I am writing about one of my favourite snakes, the green anaconda. They are the second longest snake in the world, behind the reticulated python, but they have a much wider body, making them the world’s biggest snake. They can grow up to 9 metres long and weigh over 200 kilograms. 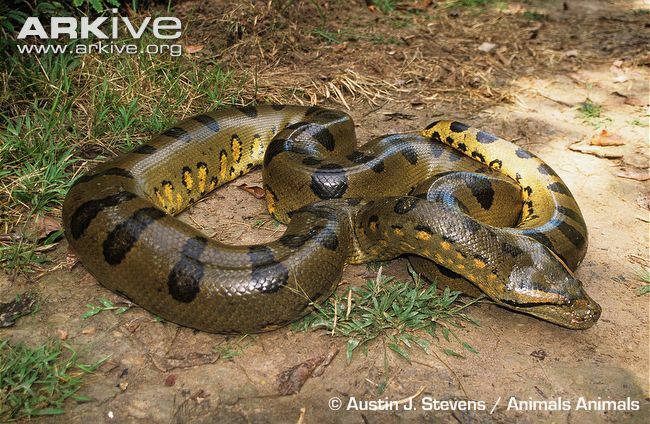 Female green anacondas are much bigger than the males, often up to 5 times bigger. They eat deer, pigs, birds, large rodents and even full-grown caimans, which are a kind of crocodile. They are not venomous, so when they catch their prey, they wrap their strong body around them and squeeze the air out of them. They unhinge their jaws, which allows them to swallow their prey whole. After a big meal, they may not need to eat for a few weeks. They are very well suited to living in water, with their eyes and nostrils on top of their head, enabling them to see and breathe whilst the rest of their body is hidden under water. They live in South America in Venezuela, Colombia, Brazil, Ecuador, Paraguay, Bolivia, Peru, Guyana, French Guiana and the island of Trinidad. Are there any other interesting facts that you would like to share about green anacondas? What is the smallest snake?????? ?